Neat, $5 USD entry point! I don't need a bunch of orcs, but I'm going to take a look at this anyway. $30 USD for the whole thing. So with 667 backers they will get the whole thing done with Wyverns and shamans and everything. Warmachines and the lot. Of course that is with 667 backers at the $30 USD level. I wonder when other companies are going to start selling minis like this? I guess when 3D printers become more mainstream. Right now, the problem is how long it takes to actually print one, and a serious lack of skill/time/commitment by the masses to purchase and learn how to use a 3D printer. The one's I've seen are not "plug and play". The Magic:the gathering card precedent springs to mind. Not to many people are printing them off at home as opposed to buying them, despite the technology being readily available and cheap and easy to use. But the point Stryderg makes is valid -- it currently takes too long to print a figure, but as a long-running project done while working on other things it's certainly viable. But printing speeds, ease of use and resolution will only increase as time goes on, making these sorts of projects even more attractive. People don't, they still buy expensive packets of cheap card in the hopes of getting what they want, or pay after market prices for them. Microwaves are available, yet people still eat out, or use an oven. I'm sure no one is saying 3d printers will take over the hobby…as that would be foolish. On the orcs. If your 3d printing them in huge quantities, as suggested, why have them multi part??? It looks to me that the peg and holes are for real world assembly? Selling a mould to pour resin or metal in sounds both quicker and better use of the technology, if this is the case. On the orcs. If your 3d printing them in huge quantities, as suggested, why have them multi part? Taking a set of 3D parts and assembling them in a 3D sculpting application before printing them is a fairly complex CAD operation for a non-designer. Printing a bunch of parts and gluing them together is a skill wargamers already have. It's also something a lot of wargamers like doing. Not everyone likes assembling multipart figures, but a lot of people do. This approach also makes customer mods easier in most cases. - Provide a custom application that combines the bits for you into individual models. This is a whole additional level of CAD and programming (yet another skill set) work. And if you add new bits that violate assumptions about other bits, you have to update (and distribute updates to) the software. HeroMaker does this with an online application, which costs them the overhead of webspace and maintaining that and accounts, and integrating their store. - Do the millions (billions, etc.) of combos and sell that big, honkin' large file set that, again, will need some type of custom app to sort through and find the ones you want after you download it for a couple months. Or serve up the trillions (quadrillions, etc.) of models online, where people get a license to pick the ones they want. Again, webspace and accounts, infrastructure, etc. - Facilitate assembly with markup in the files. Unfortunately, this approach requires variants for all the different CAD environments, slicers, and printing programs. Some suites of software would automatically assemble with the right markup. Others would not. This is probably the biggest configuration management nightmare (doing all the models out is a larger state space, but pretty straightforward to manage). None of these considerations are insurmountable. They just represent a different level of effort, cost that gets passed to the consumer, and scope in the business process. All good points. However they only prove that it's not really best use of the technology. You may as well just buy multi part kits. 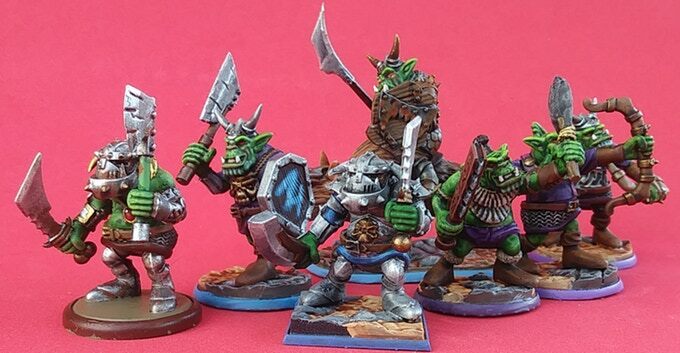 Many companies make multi part plastic sprues for orcs. And in essence, that's all your printing. Buying a bunch of loose sprues or boxes of them takes less time, and perhaps cost. Also they are HIPS with no lines from the printing to deal with. This Kickstarter seems to be offering just more of the same with not real advantage over sprues, just the added gimmick of printing them. Now, if they were one piece figures with bits you could swap out on screen, or more original characters or grunts, maybe, but that is not the case here. They look good (from the sellers printer), but only reinvent the wheel, of which there are already to many to choose from. If you have a printer then the cost of the files is about £23.00 GBP However if you already have a cheap but effective printer, the material cost would be perhaps £0.20 GBP (it could be less). If you want lots (100 or more) it make s sence, plus the variety is potentialy vast. The work to assemble the models in CAD is simple and is likeley to be within the scope of most folk owning a printer. On its own it would not justify a printer but my printer runes many hours a week on hobbys (not just wargames) and DIY so the overall cost of a printer is spread over many jobs. Also they are HIPS with no lines from the printing to deal with. This is a function of your printer. Cast items have mold lines and have to be cut from the sprue (often at high visibility places that require post work). A high end 3D printer won't have "lines". That part is up to you. You may as well just buy multi part kits. but only reinvent the wheel, of which there are already to many to choose from. The sprue buying part is not up to you. I can only buy what is on the sprues in the proportions the designer decided. So if I want one left-handed orc in ten but the design proportion was one in twenty I have to buy a lot of stuff I don't want or scrounge around for (a long time, possibly never finding) someone who has that one part left over offered for sale and then buy a small number of extra bits at a high price plus shipping. They designed this set of minis for an X of Y ratio of Figure Z, but the rules I am playing use a ratio of A to B for Figure Z. Or … I could buy this and just print the pieces I need, coming up short on nothing and having nothing extra. You could sell or trade the extra bits. I'm cleaning up a print for painting at the moment, my kingdom for a mould line. If yo can afford a top notch printer, then you can afford to have someone clean a plastic sprue. A lot of people can't afford that, so are left with print lines or a single mould line. I know which I prefer. Again. Just reinventing the wheel with an added gimmick. If that's your thing, no drama, there are worse things to be into. Strange, H man you call it a Gimmick, many of the shows I go to sell printed models so the term "gimmick" seems inapproproate for the mainstream production method for shoer or unique print runs. I most certainly not own a printer if it was only a gimmick, perhaps you spend money on gimmicks, but no me? 3d printers are gimmicks, or perhaps more accurately, novelties, at least in home wargaming and hobbies. If you need short run production you can use metal, or even resin, both if which achieve a nicer finish for a product, not to mention cheaper in both time and materials. That is a huge pain. If you actually want to move them, it takes a lot of work. If you're OK with letting them lie around for decades or just throwing away stuff you paid for, then why bother selling? Unless you are selling bits as a business, selling bits is not worth your time. If yo can afford a top notch printer, then you can afford to have someone clean a plastic sprue. The printer is a capital investment. A one-time expense amortized over all its use. The incremental cost of material is negligible. Cleaning figures from a sprue is a per unit service. It also interrupts the flow of the project. And would be extremely complex/expensive as a sole service. You would have to work out with the provider which bits (or take the task of separating the pieces) and the provider would really need to organize the bits to send back to you. The idea of inspecting 500 mold lines on pieces once you got them back to make sure you got what you paid for is just insane. However, I'm sure you can argue that such a thing makes sense. If you do, please include links to several of the hobby's teaming number of mold line removers. There are a wide variety of different printers out there, suitable for different purposes. If you bought one of the cheapest ones that was designed for children to get exposure to automation and computer use, and thus requires a lot of post work, well, that's your choice. You can get a 10 micron hobby 3D printer for $1,000 USD-$1500. Which is much less expensive than a couple hundred unique metal or resin molds, let alone, masters. Sell or trade bits. "Bag O ork bits $20 USD" sounds simple to me. I'm happy to remove mould lines for people. I do it all the time. There are many who do. Here's a link to start you off. You forget the printer upkeep costs. Also 1,000+ seems like a lot of money to me for some orcs. You also forget the cost of a computer to run it, as most require one. Add $500 USD+. And file costs as well. Power. Postage is starting to sound cheap by this point. "Which is much less expensive than a couple hundred unique metal or resin molds, let alone, masters." Your trying to Compare a retail(ish) product in printing files with masters and moulds for production (which is not a retail product). 3d files still require a computer technician to create. Possibly at a similar cost to sculpting, depending on which guy you go to. Sell or trade bits. "Bag O ork bits $20 USD USD" sounds simple to me. Again, if you want them to sit around unpurchased for decades. I have some common searches for bits on EBay, and routinely find the same things that have been up for years. The ones that sell are ones where someone is charging >50% of what they paid for the bits they don't want. So, how does this help you find the bits you want? If you are volunteering for free to search through posts with no inventory to find the bits I want. Again, the premise is you can end up with exactly the bits you want, not have random stuff. So, simple, yes … if you don't care about any outcome. Then again, if you are offering to take all the leftover stuff I have and pay me 75% of retail for them (minus my shipping, of course) pro rated per piece because you can obviously and easily sell them all quickly and make 25% profit on your investment (quite a good return), I'm listening. I didn't see any mold line removal services, only painting services. Or are you saying everyone on the list will cut bits, remove mold lines, and then sort them back out into organized bins (bags, whatever) without you committing to pay for painting as well? Are you committing to that? Maybe $.02 USD per bit? I might take you up on that, too. You forget the printer upkeep costs. Negligible when amortized across the figures you would produce. If you're downloading 3D files and shopping online, you already have one. Again, please calculate out the power cost per unit figure before you talk about what a great less than a penny each expense this is. Also 1,000+ seems like a lot of money to me for some orcs. You're argument was about 3D printing not being a novelty or gimmicky with no added value. Not just getting everything for this one project and throwing it away. If you were only going to print "some" (200? 500? 1000?) orcs and never use it for another hobby purpose, then it might be fairly expensive per unit. And file costs as well. 3d files still require a computer technician to create. And we have been talking about buying them as part of the cost. That's what the OP offers. If you want to know how low the above costs are, check out a maker space (what? you don't actually have to buy one and have a computer to and do all the other stuff yourself to 3D print minis?) and the rates for its use. Or the cost of outsourcing the printing and having it mailed. Maybe they're all volunteering to operate at a loss. No. The 3D models are not the end product you use in the hobby. They are a tool for making the end product you use in the hobby, just like metal or resin casting, which you brought up as a comparison. Or do you just assume that's all free because you would rather do that? I have a $200 USD printer and buy about two spools of $20 USD filament a month. I do the slicing on a computer that I already had that's several years old -- and you do not need a computer hooked up to the printer to print, just and SD card. It runs almost non-stop, it's only break coming when I'm not home to switch out the job. There are some things it does really well and some things it does not. Just about everything I print I could buy the same thing or something close from a vendor. But I choose to print them instead. I'm printing a lot of things I would normally not be willing to spend the money on, because making them on my printer is super cheap. I enjoy using my printer as a tool to benefit my wargaming hobby, and I've learned new skills and have done some minor manipulations of existing files using TinkerCad. Is a 3d printer a silver-bullet answer to everything? No. Am I advocating everyone run out and buy one? No. Can they be fun and contribute to the hobby? Yes. I still make things out of foam. I still buy things from hobby vendors. I'm not sure why some people feel so threatened by any positive comment about 3D printing, especially on a board dedicated to 3D printing. Like anything, there are pros and cons. If anyone needs a hobby, I suggest wargaming (in responce to the reams of writing above). "I didn't see any mold line removal services, only painting services. Or are you saying everyone on the list will cut bits, remove mold lines…Maybe $0.02 USD USD per bit? I might take you up on that, too." Yes. Most painters would offer a cleanup service. Not 2c I would expect. 20-30AU for limbs and torsos perhaps. PM me. "If you're downloading 3D files and shopping online, you already have one." Downloading a file and running programs for fancy technology are two very different things. Just because you have a computer does not mean it will run any programme forever. Computing 101. "Maybe they're all volunteering to operate at a loss." Certainly not. I've checked prices and can't find anything as cheap as the figures on a plastic sprue. They must be charging a huge markup for the prints if they are as cheap to produce as is being claimed. 3d files bought to use in your home hobby printing are very much an end product. No different to buying a computer game to play for that passtime. "I'm not sure why some people feel so threatened by any positive comment about 3D printing"
The opposite also appears to be true. I tried to leave gracefully a wile back, until people started nit picking. "I'm not sure why some people feel so threatened by any positive comment about 3D printing, especially on a board dedicated to 3D printing. Like anything, there are pros and cons." I agree fully with that last line. It would be nice for people to simply accept it and quit this annoying nitpicking. Myself included. I tried to leave gracefully a wile back, until people started nit picking. No, you made overly broad statements and responded to the discussion with incomplete and inconsistent replies. I'm just curious H Man, do you have a 3D printer? I don't. Well, not entirely. I have a few bits I have experimented with in the past. I do paint prints for clients, both miniatures and larger.